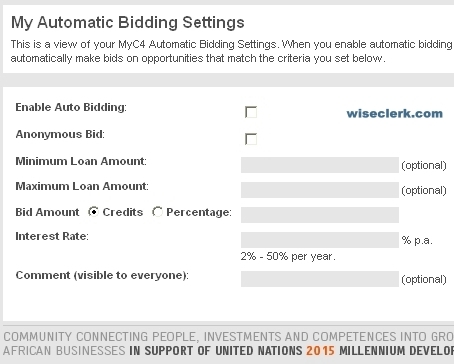 MyC4 introduced "automatic bidding", an automatic bidding assistant that will bid on any new loan listings that match parameters set by the lender. Similar to the Standing Orders feature of Prosper.com, but not with as many selection criteria. The Auto Bid request came from several of the businesses we have talked with and also several Builders who asked for a quick way of get going. MyC4 now also enables the use of Paypal to transfer money into the MyC4 account.